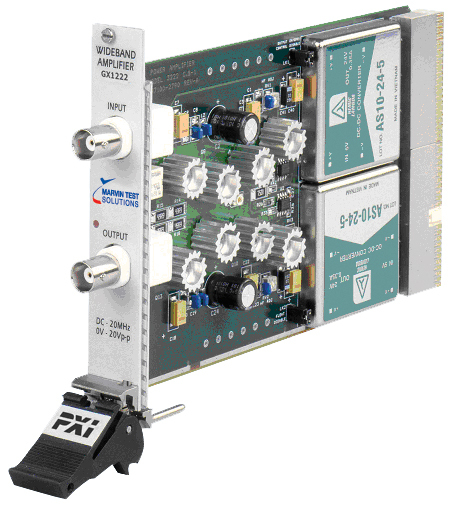 PXI Wideband Amplifier Card - GX1222 | Marvin Test Solutions, Inc. The GX1222 is a 3U single-slot, PXI-based wideband power amplifier used for signal amplification purposes. Offering excellent fidelity, the GX1222 amplifies signals from DC to over 20 MHz with a fixed gain of x10. Custom gains are also available without compromising signal purity and amplifier performance. On-board DC-DC converters and custom components allow the GX1222 to amplify signals to levels far above standard PXI voltage rails. The GX1222 can amplify input signals to an output of 40 VPP into a high impedance load, or 20 VPP into a 50 ohm load. The GX1222 can be configured with floating input and output connections allowing the amplifier to float up to 250 VDC above ground. The only limiting factor is that both the input and output grounds must connect to the same potential. This capability is very beneficial in applications where the amplifying device should reside at the same ground potential as its source. The floating capability can be added or removed using a simple, user-accessible jumper connection. The GX1222 requires only power from the PXIbus. No software driver is required to control the module. The Signal Ground option is user-selectable via jumpers; all other options must be specified at the time the GX1222 is ordered.